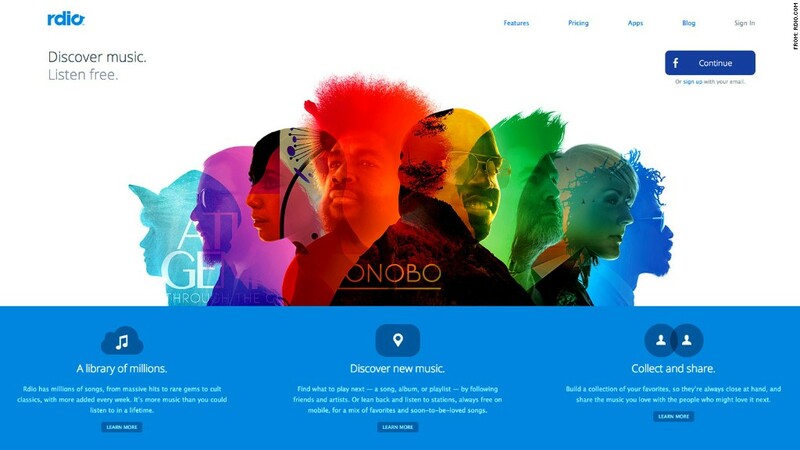 Rdio's streaming music service is easier to use and more social than Spotify. Rdio isn't the streaming music service with the most users or features. But unless you're a serious music nerd, Rdio is the most usable option. For vast amount of music fans, Rdio has the best design and functionality, making it CNNMoney's Best In Tech for the streaming music category. If you've never used a streaming music subscription service like Rdio or Spotify, understand that it's not Pandora (P). You don't pick a song or artist and then let the service build a randomly-generated playlist for you. Instead, for $10 a month, you have unfettered access to an online jukebox with tens of millions of songs. What really separates Rdio from the competition is its social backbone. You can follow friends, strangers, musicians, businesses, etc. and get a sense of what they're listening to. Rdio will also recommend songs and artists for you to check out based on your friends' interests. That may not seem like a big deal, but when you're not quite sure what to listen to, this feature is one of the best in helping you figure it out. Another standout Rdio feature is the ability to build an online library full of "your" tracks. With rival services, having your favorite music in front of you means scrolling through hundreds of playlists in the sidebar of the app. It's less than ideal. Rdio instead presents your collection as a highly visual array of album thumbnails that can be sorted in a variety of manners. But functionality aside, Rdio is just laid out and presented across all platforms (desktop, phone and Web) in manner that's visually cleaner and easier to process than its competitors. You're immediately welcomed by those friend-generated recommendations. Other details, such as being able to easily and intuitively cache an album or playlist to your phone for offline listening, also make a huge difference for average users. If you're someone who needs the ability to integrate their locally stored music with their streaming library, or if you want the service that gets all the newer, slightly more obscure music first, Rdio might not be for you. Take a look at Spotify or Google's (GOOG) All-Access service. For most people, you'll find yourself enjoying streaming music a little more while using Rdio.